As sure as the summer heat, hungry patrons head for the Golden Corral restaurant every Saturday evening. It’s not unusual to see 200 people in line, zigzagging through the Puente Hills East Parking lot. Waits at Olive Garden, Benihana’s and Chili’s also are long, proving the area to be a popular weekend dining destination in the East San Gabriel Valley. Only this weekend, the crowds may stay away due to planned freeway lane closures. “It will be interesting,” said Robert, day manager at the Golden Corral who wouldn’t give his last name. “I don’t think it will help us,” he said. He’s talking about this weekend’s 55-hour lane closure on the 60 Freeway between Fullerton Road and Nogales Street, an area just east of the Puente Hills Mall and one that includes several popular Asian-themed strip malls, including Diamond Plaza and Rowland Heights Plaza in Rowland Heights. 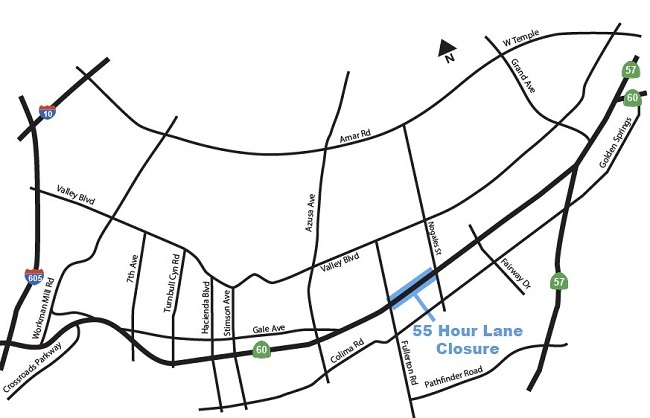 Caltrans will close three of the five westbound lanes from 10 p.m. Friday until 5 a.m. Monday for major roadwork. Read more in Steve Scauzillo’s story SLAM. From now through September, Diamond Bar City Council meetings will be held in the Windmill Community Room of City Hall at 21810 Copley Drive. Council meetings will return to the AQMD auditorium after a new audio visual systems have been installed. The meetings at City Hall will not air live on DBtv nor online through live video streaming. They will be taped and broadcast on DBtv on alternate Tuesdays at 8 p.m., as well as Saturday and Sunday at 9 a.m. They will also be available for streaming on demand at www.diamondbarca.gov/dbtv as early as the Thursday following every meeting. Meetings are held the first and third Tuesdays at 6:30 p.m. Agendas are available for public review the Friday afternoon prior to every meeting on city website, as well as City Hall and Diamond Bar Library. For more information, call the Public Information Division 909-839-7055. A 35-year-old Hacienda Heights man was convicted Tuesday by a Pomona Superior Court jury of burning down St. John Vianney Catholic Church in April 2011. In less than an hour, the jury found Gregory Yusuke Shiga guilty on all counts. “The jury just got the case this morning, and they were calling in about an hour and a half later,” said Jane Robison, spokesperson for the Los Angeles County District Attorney’s Office. Shiga was convicted of five counts, including aggravated arson, arson of a structure, arson of an inhabited structure, possession of flammable material and second-degree commercial burglary, according to the district attorney. He faces 10 years to life in state prison when he appears before Judge Thomas Falls for sentencing July 19. The fire, set shortly before Easter in April 2011, caused $9 million worth of damage to the sanctuary and several other church-owned buildings on the large property located at 1345 Turnbull Canyon Road in Hacienda Heights. Read more in Steve Scauzillo’s story GUILTY. A commercial building has collapsed and continues to burn after a basement fire eventually engulfed the building on Tuesday in Industry. 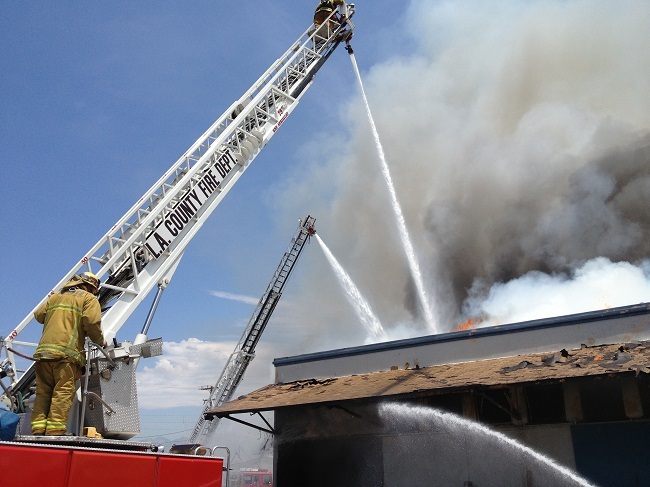 More than 100 members of the Los Angeles County Fire Department battled the blaze that started at about 10:30 a.m. Firefighters initially found flames in the basement of the structure near 9th Avenue and Clark Avenue. The initial crew could smell and see smoke upon arrival. It was only 30 minutes later the entire building was in flames. Firefighters are still targeting that fire as of 12:30 a.m. The current tactic is “surround and drown,” according to spokesperson Scott Miller. “The situation itself is very dangerous,” Miller said. One firefighter was taken to a local hospital with unspecified minor injuries, Miller said. The cause of the fire is under investigation. The building, which was abandoned, was once an insulation factory, Miller said. It is unknown what contents were stored in the basement. Caught between the green lawns and the brown hills of Southern California is the North American bobcat, Lynx rufus.While not technically endangered, scientists as recently as June have watched healthy bobcats die of severe mange, a common skin disease caused by parasitic mites normally afflicting canines. Local scientists believe the tuft-eared wildcats are being poisoned by eating gophers or ground squirrels that have ingested rat poison left in yards by homeowners or near dams and other government structures. In January, local scientists with the U.S. Geological Survey collared two bobcats as part of a $469,000 study started last fall in the Whittier-Puente Hills. After watching the healthy couple for months, suddenly the female cat, WIN, died of severe mange and her partner, ZEK, a male, a short time later also contracted severe mange and nearly died. USGS ecologists acted quickly by re-capturing ZEK a few weeks ago and speeding him to treatment. Today, he’s recuperating at an Orange County veterinarian clinic — its exact location is a secret. Will ZEK survive? “Possibly,” said Erin Boydston, USGS research ecologist working on the Whittier-Puente Hills bobcat study. “He is eating. But we don’t have the full picture on his health status,” she said Tuesday, while downloading memory cards from remote cameras her team has placed on Powder Canyon Trail in Rowland Heights. “It is still a little early to know his longer-term prognosis,” she added by email Friday. 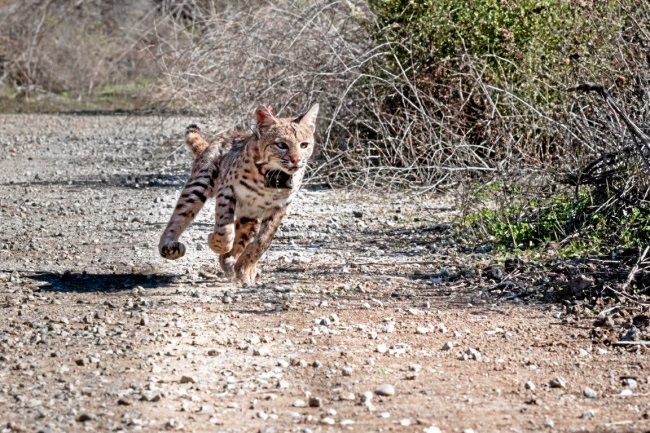 Read more in Steve Scauzillo’s story BOBCAT. The Islamic call to prayer sang out its welcome message, drawing the faithful to Friday services in Rowland Heights. Ramadan was just around the corner and the members of the local mosque had even more to be thankful for this summer. 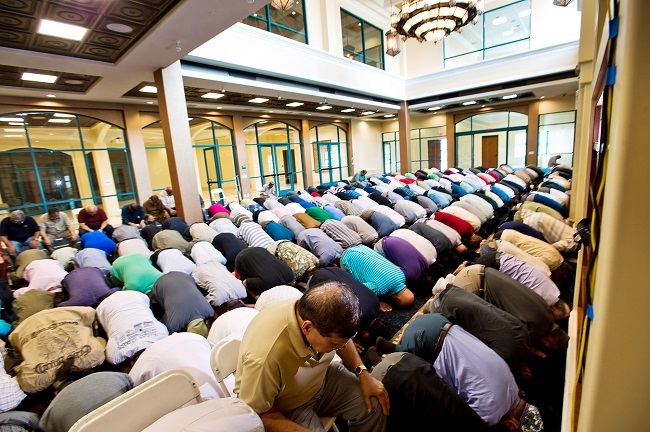 The new $5.5 million Islamic Center of San Gabriel Valley opened June 22, just in time for the holiest month in the Islamic calendar. The proud members were celebrating the culmination of six years of hard work and dedication. Inside, guests gathered in the large lobby to shelve their shoes. Before prayer, Muslims wash their hands, arms and feet. A nearby alcove offered the ceremonial ablution with automatic foot-washing baths imported from Canada. A modern mosque occupies the expansive first floor. A two-story prayer hall serves as a focal point for the faithful. Men knelt in prayer on a beautiful rug imported from Belgium. Read more in Richard Irwin’s story MOSQUE. 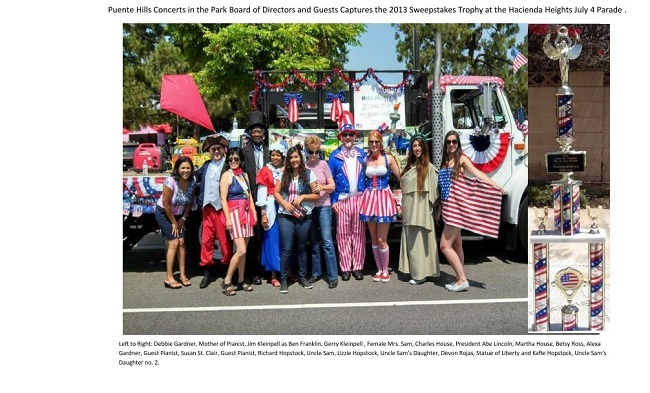 The I Love America Parade in Hacienda Heights was the best yet, according to Dave Wallach, one of the coordinators for the popular event. “We have more than 100 entries, including celebrity cars like Knight Rider, Herbie the Love Bug and the Teenage Mutant Ninja Turtle van,” Wallach said. A Volkswagen club will bring 20 Beetles, while the Hacienda Cruisers are driving their classic cars. The grand marshal was Superintendent Barbara Nakaoka, who is retiring after 43 years with the Hacienda La Puente Unified School District. She will join other local celebrities such as Twinkle Time. 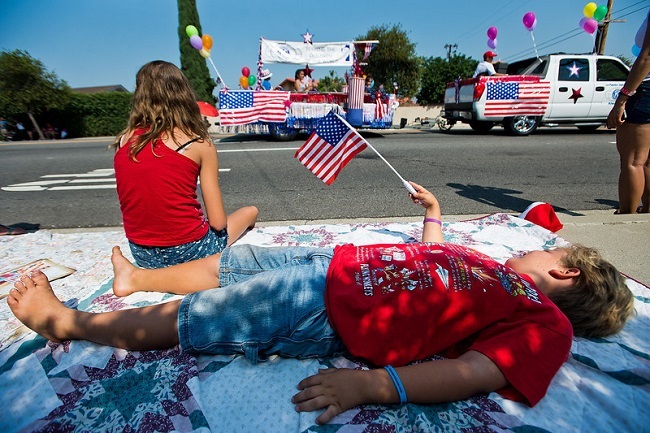 The parade began at 9 a.m. Thursday at Colima Road, marching north along Stimson Avenue to Steinmetz Park. A Fourth of July festival followed in the popular park. See the photo gallery at FOURTH. 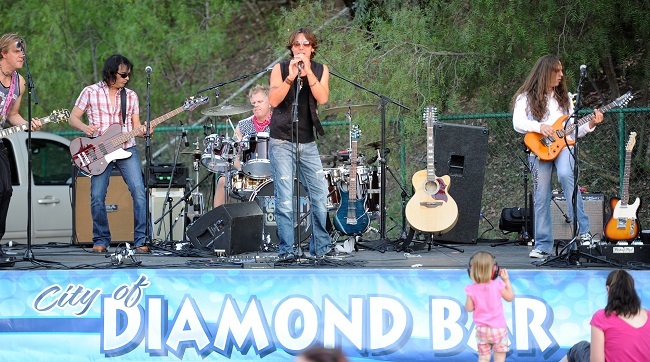 The City of Walnut will sponsor a summer concert series from July 9 to Aug. 6. 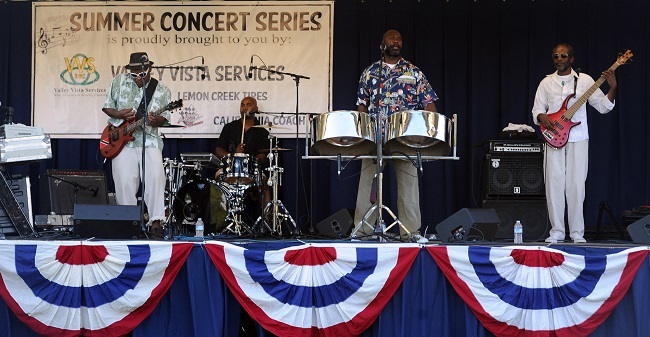 The free concerts will be held Tuesdays 6:30 pm to 8:30 p.m. at Creekside Park. The first group is Pacific Rose. Bring a picnic basket, blanket and lawn chairs to enjoy an evening of live entertainment. Food will be sold by local food trucks. Music will fill the night air on seven consecutive Wednesday evenings, beginning July 10 in Sycamore Park. The first concert is the Latin group Bumptown. Come for the concert, stay for the movie. The Movies under the Stars series offers family friendly, PG movies that begin at dusk or 8:30 p.m. following the concert performance at Sycamore Canyon Park.